The purpose of this paper is to document the integration of Web 2.0  services into the working framework of some of the most advanced academic libraries in the world. It reports a follow-up study that builds on a previous study conducted approximately two years ago. The comparison of those two studies produces interesting findings, notably an increase in the integration of web-based services. However, when some of the most core Web 2.0 services were examined, user participation was quite low. A quantitative approach to the content analysis of library web sites was performed to examine the prominence of twelve pre-determined services. In addition, the literature review focuses on the critical opinions expressed regarding the use of these web services by academic libraries, highlighting some of the problems and issues that have been raised, but are often overlooked. The aim of this paper is twofold. The primary focus is to research and document the integration of services based on the web into the framework of academic libraries. To support this, there is a comparison of data from this study with data from a previous study reported at the IFLA Pre-Conference in Athens (Gerolimos and Konsta, 2009). The 2009 study researched the use of six library services in an attempt to determine their acceptance in the service context of academic libraries. These services are: RSS, instant messaging, streaming media, weblogs, tags and social networks. The findings included (but are not limited to) a rather low usage of those services, and evidence that Really Simple Syndication (RSS) was the only widely used web service among the six, and tags was the least used. The integration of a specific set of services is re-examined after two years, a period of time that can provide some clues as to the state of affairs in the field of academic libraries and the incorporation of web services. The implementation of several web services was recorded, showing an increase in provision, but, at the same time, there was not a corresponding increase in user participation in several of these services. Consequently, these services may not have the anticipated impact on the strategic service plans of libraries. The research was conducted between November 2010 and February 2011. The sample includes the library web sites of the 200 best universities for the year 2008, and the data were taken from the web site of the central library of each institution. The purpose was to document the usage of twelve library services: the six services mentioned above with the addition of Facebook, Twitter, web site interface for mobile devices, reference service via SMS, YouTube and browser toolbars. A thorough examination of the contents of each web site, including the search function, were the primary tools of data discovery. Secondly, an attempt has been made to capture some of the issues that have arisen with the increasing popularity of social tools and software in academic libraries, primarily the introduction and use of social networking services. The findings do not include a measurement of the quality or the efficiency of the services that the libraries offer to their patrons, but simply provide an impression of the developments in a specific area of interest, focusing on the implementation of a set of library services. A comprehensive review of the literature revealed a rather limited discussion of the issues and failures that a library may face associated with the implementation of web-based services. The balance of the published literature reports the potential and the opportunities that these news services present to academic libraries. The present review is not necessarily representative, as it emphasizes the concerns voiced in the literature regarding the use of the services surveyed in this paper. The issue of user privacy and personal data, although very important topics, should only be one aspect of the discussion regarding web services. A mature discussion that addresses the shortcomings of those services, and might create the right conditions for development and evolution, can only be a source of problems and mishaps if too much enthusiasm for the web negatively affects the service orientation of providers. Therefore, scholarly discussion and the literature should record, investigate and evaluate several other issues directly related to web services. These include efficiency, the willingness of users to engage actively, longevity, duplication of existing services, hybridization between new and traditional services, evolution of services, integrated online library systems, and last, but not least, the history of library services, with an emphasis on the ideas and philosophy that underpin them. Crawford is among the first to criticize the notion behind the 2.0 suffix in library services. First he deconstructed the ideas that are the foundation of these changes (2006), and he returned to the questions later and added that not much had changed (2009). He noted that there was a significant, but fallible, project movement (2011a) and that we need to find a balance between new and old services (2011b). Joint (2010) writes that librarians are trying to make a technology that did not originate in the library world look as though it is a library technology. He also argues that the revolutionary nature of web services has not, at least until now, revolutionized the library services. Joint (2009) also provides an insight into library decisions at Strathclyde University to move away from the experimental usage of web services like Instant Messaging (IM) and Second Life. Breeding (2007) highlights the risk of confining the use of the web within the library context, when specific tools are promoted. He argues that before libraries move to the next generation of services, many will have to catch up with the previous generation (Breeding, 2006). There is the danger that we may already have gone beyond that point by labeling some new provision as "2.0 service", but at the same time we are branding some features as "web services" and "service strategies" even though they have been in libraries for decades in other forms, including instant messaging, user-centered services, the dissemination of information and libraries' (physical) social networks, to name but a few. Brown-Sica and Beall (2008) address the problem of "hate speech" that arises with the inclusion of user-generated content in library information systems, while Wolf (2008) argues that the web has been a breeding ground for hate, especially through its mainstream services like YouTube, Facebook and MySpace. Davenport (2008) points out that another risk associated with web use, not only by librarians but in a general social context, is the lack of diversity and the risk of conformity. The Beluga Project investigated users' opinions of the next generation of library catalogues and found that users are unwilling to create content (tags, reviews, ratings) and share literature lists, that they disapprove of linking catalogues to Amazon metadata, and they complained about the over-simplicity of the catalogue interface (Christensen, 2009). Kim (2010 p. 70) reports that the users of an academic library find it hard to customize its web site while Merčun and Žumer (2008 p. 247) recognize the impact that the web had on library catalogues but they also state that many of the ideas and concepts behind the next generation catalogue are older than the web itself. Nesta and Mi (2011) are among the few who place the next generation library services in a historical perspective. They examined the websites of academic libraries in New Jersey and Hong-Kong to document the adoption of web services, and they concluded that libraries implement these services without evaluating their potential. Harinarayana and Raju (2010) studied the library websites of the top 100 universities for the year 2007 according to the Times Higher Education university rankings, and they concluded that RSS and IM have the highest integration. Tripathi and Kumar (2010) examined 277 randomly selected academic library web sites. The integration of the six web services that they studied ranged from 2.2% (Vodcast) to 43.7% (IM). Kim and Abbas (2010) conducted a research study that focused on US academic libraries and the use of several of the services that are also examined in this paper, and concluded that RSS and weblogs are the most widespread choices. They also found that the utilization of those services by library patrons is rather limited. Han and Liu's (2010) study in Chinese university libraries showed that the use of web applications is quite low. Chua and Goh (2010 p. 206) browsed the websites of 120 academic and public libraries in North America, Europe and Asia, and found weblogs to be the most popular service and tags the least. In addition, they found that North American libraries engage more web technology than European and Asian libraries, and this is confirmed by the findings of this paper. Dickson and Holley (2010) reviewed the literature on the use of social networking tools in American academic libraries from 2006 to 2009, acknowledging that their research was limited by the absence of statistical analysis of the effectiveness of social networking and a possible shift in the popularity of these services. They identified several well-founded concerns about the use of social networking sites by academic libraries: they are time-consuming, they are not heavily used, and users already have a negative view of them. Xu, et. al. (2009 p. 329) surveyed the web sites of 81 academic libraries in New York State. They concluded that IM is the most popular choice with an adoption rate of 42% and podcast is the least popular with 2% uptake. They also tried to identify the key qualifications and roles an academic librarian should have to successfully support this new service orientation: creativity, user-orientation, active participation, contributor, organizer, facilitator and coordinator. One could argue that their compilation highlights the job description and duty assignment of an academic librarian of the pre-web era. Linh (2008) investigated 47 university libraries in Australia and New-Zealand. He found that there was a general interest in web tools, but the general level of implementation was low. RSS was the most used and IM the least used service. The diversity in results relating to service popularity in the literature can be attributed to the difference in time and location, but also to the experimental nature of many of the implementations. It appears, though, that RSS, IM and weblogs are the most popular choices, a conclusion that is, partially, confirmed by this study as well. Although the RSS technology is widely used by academic libraries, it should not be considered as social software, but a way to bridge the various social software applications using an XML format (Secker and Price, 2007 p. 42). Holvoet (2006) and Mu (2008) write about the features and different functions RSS can have for libraries. Blackburn and Walker (2008) discuss some of the wrong steps that libraries take when they promote RSS to users. Academic libraries use the RSS service to inform their users of library news and developments in a way that resembles the "news service" that many libraries still have, often in collaboration with the RSS service: changes to the library's schedule, new acquisitions, library renovations, exhibitions, etc. This service presents some interesting opportunities for libraries to reach out to their users but there are still several issues that need to be addressed. Although it has been reported in several cases that instant messaging can be a useful tool for academic libraries, especially in relation to reference services, there are arguments that this service can be inefficient or inappropriate for some libraries because of limited funds, low volume of use, technical inefficiencies and staffing problems; issues that lead, in some cases, to the decision to discontinue its use (Radford and Kern, 2006). For example, the librarians at Massachusetts Institute of Technology (MIT) experienced a lower traffic for the online reference service than the previous e-mail service (Horowitz, et. al., 2005), while at Strathclyde University library the relatively low volume of the IM reference service (about 1/50 of the enquiries of the traditional reference service) led to the decision to discontinue the service (Joint, 2009 p. 170). Another interesting aspect of this service is that many of the patrons use this service from within the library's building (Desai, 2003 p. 26). Clements (2009) and Shucha (2007) identify the positives and negatives of instant messaging software available to libraries. Desai (2003 p. 22) provides a reflective analysis of this service. She writes that, "Instant messaging is above all a personalized service requiring time and typing. Therefore it is no faster than dealing with people face-to-face or on the phone" which implies that instant messaging is not that instant. Weblogs are the subject of several papers regarding different aspects of their use by libraries and librarians and World Wide Web users. Hendricks (2010) investigates the possibility of thinking about weblogs as a scholarly activity and Johnson (2008) stresses the issue of longevity of both personal and institutional library weblogs. Hall and Davidson (2007) argue that weblogs can be effective learning tools and Aharony (2010) researched the comments posted on LIS blogs  professional and personal  and concluded that there is a low dynamic in content creation. Moreover, this study recorded that library weblogs do not contribute to what has become known as "content creation" and the "participatory Web", since they are mainly used as a platform for delivering library news and not as an open discussion forum that library patrons use to interact with library personnel and other users. In fact, the cases where library weblogs include patron comments are rare, despite the fact that the user comments feature is enabled in many libraries' weblogs, as mentioned below. An interesting study by Thomas, et. al. (2009) on tag use by libraries concluded that a mixture of both controlled and uncontrolled vocabulary would benefit libraries and their catalogues the most. This is an opinion that Steele (2009) shares, but he also identifies some issues to be considered when implementing user tags in library catalogues, such as polysemy, synonymy, plurality and luck of hierarchy. Redden (2010) reports several uses tags can have for an academic library and Aharony (2009) explores the use of tags in library science weblogs. The notable increase of tag services in library OPACs (Online Public Access Catalogues) shown in Figure 2 it is not always accompanied by a commensurate increase in user participation, and there were only a few cases where we found user-generated tags. The increase in tag service implementation should, rather, be attributed to the new online catalogue software that many libraries around the world purchased and this updated software includes, in many cases, the built-in ability to allow registered user comments and tags to be added to library catalogue records. This was apparent in those cases where the classical online catalogue does not allow user tags while the new system does, as was the case with the Fondren Library at Rice University, the Georgia Tech Library and Information Center, and the University of Minnesota Libraries. Overall, 81% of the libraries in the sample that provide the tag service allow their users to add tags to library records. Social networking sites have been at the forefront of discussion about the use of the web in libraries but there are several issues that might need to be considered (or reconsidered). Sekyere (2009 p. 26) argues that students use Facebook to escape, even for a short period of time, from their academic responsibilities, which is the opposite of what led academic libraries to exploit Facebook in the first place. Smith and Caruso (2010 p. 14) surveyed over 36,000 students and found that although more than 90% use social networking sites, only 30% of them use those sites for course-related purposes and 8% to communicate with course instructors. Fuchs (2009 p. 89) reports that university students consider the provision of information and news to be a minor advantage of social networking sites, with eight other purposes being valued more highly. Another aspect to consider when a library creates an account with a social network service, such as Facebook or MySpace, is the possibility that a portion of the targeted audience will reject the library's aim of finding new ways of communicating because they will think their privacy is, potentially, infringed, despite the fact they are users of that particular service (Connell, 2009) or simply because they do not want libraries as their "friends" (Breeding, 2007). Secker (2008) also reported students' concerns about libraries infiltrating their social spaces through Facebook. Xia (2009) investigated library related Facebook groups at two universities and found that it was hard for those groups to maintain a steady flow of posts and participation by the students. Scale (2008) studied the role of Facebook as a social search engine and concluded that it is mainly irrelevant, and Matthews (2006) had a response rate of only 3.2% when he reached out to his library audience through Facebook. Moreover, librarians who decide to use Facebook as a tool for marketing and promotion of library services should be aware of the fact that they might find themselves in an environment where the level of professionalism found in their libraries is difficult to maintain (Graham, et. al., 2007). Chu and Meulemans (2008) consider Facebook and MySpace to be good outreach tools for an academic library alongside other, older outreach tools. Moreover, we should carefully consider if we should create applications and encourage our patrons to use them on some of the social networking sites, when it is now reported that user data are transmitted through various applications to advertising companies on the web (Steel and Fowler, 2010). Should we consider our list of "friends" as part of our services, when we know that it may be exploited for profit? (Stone, 2010). We might expect a commercial service to try to make a profit by selling user data. Problems can arise when institutions that users trust choose to lead users away from safe places and expose them to possible exploitation by third party services (Joint, 2010 p. 493). Fuchs (2009 p. 22) argues that the users of social networking sites are under constant state and economic surveillance. The research was conducted between November 2010 and February 2011. The sample of libraries is the same as the one used in the previous study. The sample includes the library web sites of the 200 best universities for the year 2008, according to the list provided by the QS, World Universities Rankings . Data were taken from the web site of the central library of each institution. The 2009 research included six services: RSS, instant messaging, streaming media, weblogs, tags and social networks. The present study includes six additional services, a choice aiming not only to adapt to new scientific data, but also to cover a wider range of library activities provided through the Internet and the web. These additional six services are Facebook, Twitter, a web site interface for mobile devices, reference services via SMS, YouTube and browser toolbars/add-ons. The content of each web site, along with the individual hyperlinks and categories that every library web site has, were browsed to check the availability of the twelve categories mentioned above. After the initial browsing, the search function of each library was explored using terms like "blog", "video", "tutorial" and "Twitter" to retrieve information about services not discovered up to that point. In addition, the Google search engine was used to retrieve information on Facebook, Twitter and YouTube accounts using the name of the library and the three terms respectively, as the third and final step. When a service was found, it was recorded as "Yes", but if none of the above methods discovered a service, it was recorded as "No". Only active weblogs are recorded. Tag service documents its use only in online catalogue records. The social networks category includes all related web services and sites (like Flickr and Delicious) with the exception of Facebook and Twitter. The YouTube category records whether the library has uploaded any video or created a channel in that particular online service. YouTube videos, available on a library web site but not uploaded by the library, are documented in the Streaming Media category. The instant messaging category does not include e-mail and online question forms. The SMS reference category records the use of mobile devices (most notably cell phones) in order to send and receive text messages. As shown in Figure 1 below, RSS is inarguably the most popular library service among the twelve recorded here and it is used by 157 libraries. It was also the most widely implemented service in the previous study. 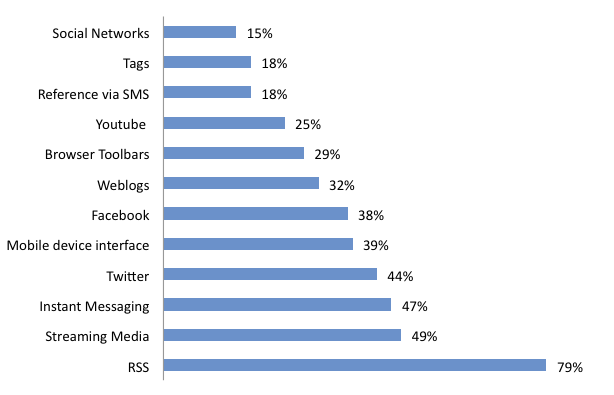 In addition, as was the case with the 2009 research, tags are the least used library service and are used by only 36 libraries  social networks are used by 52% if Facebook and Twitter are included. Furthermore, instant messaging is used by 93 libraries and steaming media services by 97, which represents a reasonable level of acceptance. It came as a small surprise that Twitter is more popular than Facebook (87 and 75 libraries respectively) considering that there are almost three times as many users of Facebook as there are of Twitter . There seems to be only a loose connection between Facebook and Twitter use in libraries, since only 75% of the libraries that use Facebook use Twitter as well, while 70% of libraries that have a Twitter account also use Facebook. Eighty-three libraries (41.5%) have neither a Facebook nor a Twitter account. YouTube as a service is implemented in 50 libraries, and weblogs in 64. Although they are two of the most popular web services available today, they are still not widely implemented in academic libraries. In addition, it was found that 42% of the libraries utilize the weblog technology exclusively as a news service. Furthermore, the research showed that the trend towards the connectivity of mobile devices has influenced several libraries to provide access to their online services, and 77 libraries had created a mobile version of their web site, but only 17% of them designed a special graphical interface for that purpose. Some libraries designed interfaces for mobile devices that only provide access to the online catalogue, e.g. University of Waterloo Library and University of Tokyo Library. SMS reference is available in 36 libraries and 30 libraries use other social networking services (mostly Flickr and Delicious) in addition to Facebook and Twitter. As a side note, more than 35% of the libraries have implemented Google Books service in their catalogues. It did not go unnoticed that the interest that library patrons showed in core web services (Twitter, Facebook, YouTube and weblogs) was rather limited. Despite the fact that measuring the effectiveness of library services in terms of the "likes", "followers", "comments" or "view counts" may not be the most scientific method of data gathering, it does provide a measure of their acceptance  or rather an estimate of their impact and, ultimately, their usage. With very few exceptions, library pages of some of the core web services recorded only limited participation by library users, based on the volume of users taking advantage of those services. For example, as of 14 February 2011, an average of only 750 users had attached "likes" to one of the 75 library pages on Facebook, out of a total number of 56,247. The library that has the highest "likes" count is the National Taiwan University Library with 7,864 and the lowest is the Biblioth�que Cantonale et Universitaire  Lausanne with 34. Furthermore, as of 15 February 2011, we found that the 87 library Twitter accounts have, on average, 520 followers with a total of 45,216. The library with the largest number of followers is the MIT Libraries with 2,564 and the smallest number was found to be the Indian Institute of Technology Bombay Library with no followers. The average view counts of library videos on the 38 library YouTube channels is 574, as of 16 February 2011. The library with the highest average view, regardless of the number of videos uploaded, is the Maastricht University Library, with an average of 4,472 views and the lowest average view count was recorded for the University of Virginia Library with an average of three views. In a more detailed view of YouTube, the University of Michigan Library created a YouTube channel in October 2009. It has 30 subscribers and the library has uploaded a total of 90 videos that have been viewed 16,116 times, or 179 views per video. The Fondren Library at Rice University YouTube channel has been available since December 2008 and has 14 subscribers. The library has uploaded 19 videos that have, in total, 8,332 views, or an average of 439 views. The University of Virginia Library has uploaded three videos on YouTube in the past three months and they have received a total of eight views. A video uploaded by the Maastricht University Library on YouTube has one of the highest view counts (12,955). This video shows students rushing into the library on a Saturday morning during the examination period. As of 22 February 2011, 39 library weblogs from the sample that allow user comments were accessed with the sole purpose of counting the ratio between post and comments. There was no investigation regarding the content or the purpose of the posts, the original poster, etc. After viewing 842 weblog posts from various libraries (about 20 to 25 most recent posts from each weblog) a total of 230 comments were found, which translates into 0.27 comments for each library post. Fifteen weblogs (38%) had no comments and of those that had comments, six weblogs (25%) contained 146 comments (63%). Comparing with data from the previous study, we found that the RSS service had been discontinued by 7.5% of the libraries, while 7.5% of libraries had also stopped offering instant messaging services and 14% quit using any kind of social network services. Furthermore, 30.6% of the libraries are not interested in providing streaming media any more, while 47.3% decided that maintaining a weblog does not provide a useful service to their users. This should be considered in conjunction with the increase in the use of RSS and Twitter as well as with the fact that many libraries use weblogs as news platform and not as a tool for communication. In addition, the discontinuation in tags service was the most notable, since 64.7% of libraries do not use them anymore. However, the original sample in this category was very small and we cannot safely reach any conclusions. Comparison of the two studies shows a notable increase in the integration of social software services, as shown in Figure 2. Weblogs as a library service has the smallest increase (4%) a development affected by the fact that 47.3% of the libraries decided to discontinue this service, as mentioned in section 4.2. In addition, the use of this service has probably been influenced by the use of two other services documented in this paper, RSS and Twitter. This, however, does not imply that there are not several libraries that consider weblogs to be a useful service tool. On the other hand, tags (9.5% increase) and social networks services (27% increase) have a notable increase (mostly because Facebook and Twitter use has increased). Although the latter was expected (considering the increasing use of social networks in general, and that those services are free to use) the increase in the use of tags should be treated with skepticism since investigation in library catalogue records indicated that user-generated tags in library OPACs were, as mentioned before, limited. Another interesting facet was the analysis of data according to the location of the library, divided into three different continents as shown in Figure 3. The North America sample is 69 libraries, Europe is 82 and Asia is 32. The samples for Australia and New Zealand and South America were too small and for that reason the data were excluded. On average, academic libraries use 4.3 services out of the twelve. The average for North American libraries is 6.8, while for European and Asian libraries it is 2.9. There are twelve libraries that do not use any of the services and only two were found to use all of them (Emory University Libraries and University of Texas Libraries). If this study reported the use of those twelve services by academic libraries in North America, then the findings would be different. 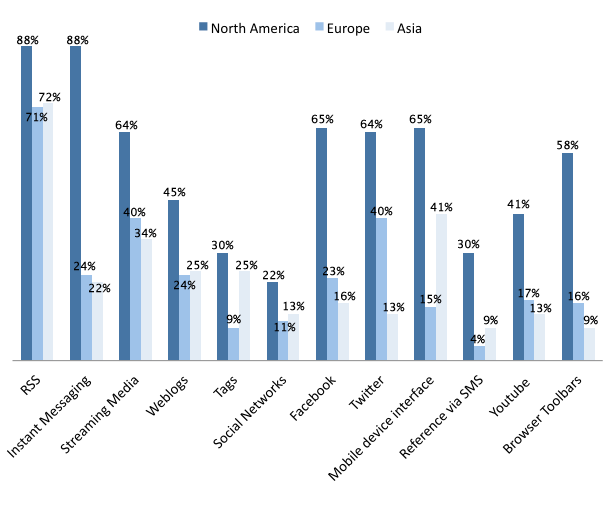 In several categories percentage of libraries in North America implementing a service is three or four times the rate of European and Asian libraries (for example, instant messaging, Facebook and browser toolbars) and in all cases it is higher, which provides evidence that the libraries in America have invested more in those particular web services. This, certainly, does not suggest that North American libraries are better organized or that they provide more adequate services. In addition, a comparison of European and Asian academic libraries in the sample reveals a balance in the use of services examined here. European libraries clearly use some services more, like Facebook and Twitter, while Asian libraries have implemented more services such as tags and library web site interfaces for mobile devices than libraries in Europe. However, both European and Asian academic libraries have lower rates of web service implementation than North American libraries. It would be reasonable to conclude that academic libraries in Europe and Asia rely more on a traditional web site service model developed about a decade ago. Academic libraries in North America have a strong orientation towards RSS and IM services. Also, many libraries have developed an interface of their web site for access from a mobile device and in-house tools for browsing their web sites. In addition, they favour Facebook and Twitter. There is also a trend towards the SMS reference service, which can be seen only in North America, while in Europe and Asia there are very few libraries that offer reference services using this technology. This method of data gathering can only record a portion of user participation and data access. For example, we found that RSS is widely used by libraries but we cannot record the extent to which subscribers use each RSS channel, nor can we document how many viewers each library Facebook page has. We documented a low level of participation in library weblogs when we searched for user-generated comments, but this does not exclude the possibility that library users actually read the posts for information. It appears that the new library services, although they were launched as a direct or indirect result of the web, do not always contribute to some of its primary supposed contributions, namely participation and content creation/contribution. On the contrary, it would appear that library patrons continue to use those services in a very old-fashioned way, relying on some core functions that libraries perform, namely information discovery and retrieval. Furthermore, web services should not be considered in terms of their social element, but rather as the implementation of new technologies within a framework of a library's daily functions. Technologies that were not developed to be used in libraries (e.g. e-mail, chat services, even computers) have been successfully incorporated into libraries for many decades now, and we should think about the newer technologies as an extension of the move towards an automated library environment that is constantly adapting to social, economic and informational developments. Nesta and Mi (2011 p. 93) point out that the "designation 'Library 2.0' is ahistorical and ignores the developments of libraries in the twentieth century". Socializing our services is an around the clock job, and we should be prepared to invest our time in these services, not only because of the extra workload, but mainly because today's popular web services might be tomorrow's out-of-date, old and indifferent web services. We should carefully examine our options before engaging in an endless race to catch up with the most popular web service. Although user preferences can change rather quickly, our commitment and investment in time, energy, money and, ultimately, status cannot. Libraries should try to draw attention to their (digital or physical) space by offering exceptional online services, ones that focus on the product delivered, rather than the popularity of the medium itself. Breeding (2007) says that the web has become a marketing concept that is trendy. A trendy marketing tool for librarians but not for libraries, one might add. Poor promotion should be seen as a poor excuse for an unsuccessful web service implementation. There has been so much web hype that if our students have not found our Facebook page by now it is not because it was not promoted properly, but because they did not care enough to search for it. User willingness is the key to the success of new and trendy services. We should not, for example, confuse the popularity of YouTube videos related to music, funny incidents, sports footage, news feeds etc., with the willingness of users to watch a video that explains how to use a library catalogue. The medium is nice but the library related audience should be considered limited. This paper provides insights regarding not only the implementation of new services in academic libraries, but also records data about their acceptance by their users. This is only one step among many in our attempt to understand (and not determine) what the future of library services will be. This will be a future that will include both traditional and innovative methods for user-orientated services, physical and web tools, failures and successes. We are evolving, as we always have, but we are now moving at a faster pace since the environment is also moving faster. Our efficiency, however, is based not only on the timely integration of new tools, but mostly on our understanding and evaluation of their use. This research has illustrated a different approach regarding a set of service tools and provides an evaluation of the services that have been gradually increasing. But now the time has come to evaluate them on a broader basis drawing on facts and not assumptions. This evaluation will not necessarily provide a once and for all conclusion. Different approaches might be needed for different cases. Some services have been dropped, and many others should follow, on the basis of whether users will engage and, more importantly, stay engaged with a library activity, and not just because that activity uses the same tool or service that they use elsewhere in their social activities. As was the case with the previous study, it seems that those services that are not core web services, such as instant messaging or RSS, are more easily accepted by academic libraries and could, eventually, be fully integrated. However, we need to focus on the creation of integrated library online systems (ILOS) that will provide a universal platform for library services, following the example of integrated library systems. Every time we implement a new online service we should have in mind what Breeding (2007) points out, namely the risk of creating small containers of information that are not connected with other parts of the online information space that a library creates. We should, finally, consider the possibility that the integration and use of many diverse technologies in a library's online information space, inside and outside its web site, leads inevitably to data loss, poor service orientation, lack of flexibility, and, ultimately, reduced ability to retrieve information. [n1] The authors consider that the terms that have been coined in recent years to describe the advent of some services and software on the World Wide Web, such as "Web 2.0", "social web", "participatory Web" etc., are sort-sighted and only describe a portion of what was already in place since the creation of the Web. Moreover, the authors dismiss the use of the 2.0 suffix in general and in the field of Library Science in particular. The universal word web is used in the text to replace those terms, and refers to the World Wide Web. [n2] QS, World Universities Rankings, 2008. [n3] According to Twitter's official site, there are over 175 million registered users (September 2010), while according to Facebook's official site, there are over 500 million users (July 2010). All electronic resources were last accessed on 6 July 2011. Aharony, Noa (2009), "Librarians and information scientists in the blogosphere: an exploratory analysis", Library and Information Science Research, 31 (3): 174-181. Aharony, Noa (2010), "LIS blog comments: an exploratory analysis", Libri, 60 (1): 65-77. Blackburn, Gemma and Mary Walker (2008), "Rightly Sore Subscribers: where libraries are going wrong with RSS", available at: http://soar.wichita.edu/dspace/handle/10057/1652. Breeding, Marshall (2006), "Web 2.0? Let's get to Web 1.0 first", Computers in Libraries, 26 (5): 30-33. Breeding, Marshall (2007), "We need to go beyond Web 2.0", Computers in Libraries, 27 (5): 22-26. Brown-Sica, Margaret and Jeffrey Beall (2008), "Library 2.0 and the problem of hate speech", Electronic Journal of Academic and Special Librarianship, 9 (2). Christensen, Anne (2009), "Next generations catalogs: what do users think? Conclusions from the Beluga Projekt in Hamburg", IFLA Satellite Meetings in Florence, Emerging trends in technology: libraries between Web 2.0, semantic web and search technology, 19-20 August 2009, Florence, Italy, available at: http://www.ifla2009satelliteflorence.it/meeting3/program/assets/AnnChristensen.pdf. Chu, Melanie and Yvonne Nalani Meulemans (2008), "The problems and potential of MySpace and Facebook usage in academic libraries", Internet Reference Services Quarterly, 13 (1): 69-85. Chua, Alton Y. K. and Dion H. Goh (2010), "A study of Web 2.0 applications in library websites", Library & Information Science Research, 32 (3): 203-211. Clements, Charlotte (2009), "Implementing instant messaging in four university libraries", Library Hi Tech, 27 (3): 393-402. Connell, Ruth Sara (2009), "Academic libraries, Facebook and MySpace, and student outreach: a survey of student opinion", portal: Libraries and the Academy, 9 (1): 25-36. Crawford, Walt (2006), "Library 2.0 and "Library 2.0"", Cites and Insights, 6 (2): 1-32, available at: http://citesandinsights.info/civ6i2.pdf. Crawford, Walt (2009), "Making it work: Library 2.0 revised", Cites and Insights, 9 (9): 25-32, available at: http://citesandinsights.info/civ9i9.pdf. Crawford, Walt, (2011a), "Five years later: Library 2.0 and balance", Cites and Insights, 11 (2): 1-26, available at: http://citesandinsights.info/civ11i2.pdf. Crawford, Walt, (2011b), "Five years later: Library 2.0 and balance (cont. )", Cites and Insights, 11 (3): 1-22, available at: http://citesandinsights.info/civ11i3.pdf. Davenport, Tom (2008), "Is Web 2.0 living on thin air?" [Weblog post], available at: http://blogs.hbr.org/davenport/2008/10/is_web_20_living_on_thin_air.html. Desai, Christina M. (2003), "Instant messaging reference: how does it compare? ", The Electronic Library, 21 (1): 21-30. Dickson, Andrea and Robert P. Holley (2010), "Social networking in academic libraries: the possibilities and the concerns", New Library World, 111 (11/12): 468-479. Fuchs, Christian. Social networking sites and the surveillance society. A critical case study of the usage of studiVZ, Facebook, and MySpace by students in Salzburg in the context of electronic surveillance, Vienna: Forschungsgruppe "Unified Theory of Information Research Group", 2009, available at: http://fuchs.icts.sbg.ac.at/SNS_Surveillance_Fuchs.pdf. Gerolimos, Michalis and Rania Konsta (2009), "Academic libraries and Library 2.0: are we getting there? ", Service Strategies for Libraries, IFLA Satellite Meeting, 19-21 August 2009, Athens, Greece. Graham, Jamie M., Allison Faix and Lisa Hartman (2009), "Crashing the Facebook party: one library's experiences in the students' domain", Library Review, 58 (3): 228-236. Hall, Hazel and Brian Davidson (2007), "Social software as support in hybrid learning environments: the value of the blog as a tool for reflective learning and peer support", Library & Information Science Research, 29 (2): 163-187. Han, Zhiping and Yan Quan Liu (2010), "Web 2.0 applications in top Chinese university libraries", Library Hi Tech, 28 (1): 41-62. Harinarayana, N. S. and N. Vasantha Raju (2010), "Web 2.0 features in university library web sites", The Electronic Library, 28 (1): 69-88. Hendricks, Arthur (2010), "Bloggership, or is publishing a blog scholarship? A survey of academic librarians", Library Hi Tech, 28 (3): 470-477. Holvoet, Katherine (2006), "What is RSS and how can libraries use it to improve patron service? ", Library Hi Tech News, 23 (8): 32-33. Horowitz, Lisa R., Patricia A. Flanagan and Deborah L. Helman, (2005), "The viability of live online reference: an assessment", portal: Libraries and the Academy, 5 (2): 239-258. Johnson, Kay (2008), "Are blogs here to stay? : an examination of the longevity and currency of a static list of Library and Information Science weblogs", Serials Review, 34 (3): 199-204. Joint, Nicholas (2009), "The Web 2.0 challenge to libraries", Library Review, 58 (3): 167-175. Joint, Nicholas (2010), "Web 2.0 and the library: a transformational technology? ", Library Review, 59 (7): 489-497. Kim, Yong-Mi (2010), "User's perceptions of university library websites: a unifying view", Library and Information Science Research, 33 (1): 63-72. Kim, Yong-Mi and June Abbas (2010), "Adoption of Library 2.0 functionalities by academic libraries and users: a knowledge management perspective", Journal of Academic Librarianship, 36 (3): 211-218. Linh, Nguyen Cuong (2008), "A survey of the application of Web 2.0 in Australasian university libraries", Library Hi Tech, 26 (4): 630-653. Matthews, Brian S. (2006), "Do you Facebook? Networking with students online", C&RL News, 67 (5): 306-307. Merčun, Tanja and Maja Žumer (2008), "Next generation of catalogues for the next generation of users: a comparison of six library catalogues", Program: Electronic Library and Information Systems, 42 (3): 243-261. Mu, Cuiying (2008), "Using RSS Feeds and social bookmarking tools to keep current", Library Hi Tech News, 25 (9): 10-11. Nesta, Frederick and Jia Mi (2011), "Library 2.0 or Library III: returning to leadership", Library Management, 32 (1/2): 85-97. Radford, Marie L. and M. Kathleen Kern (2006), "A multiple-case study investigation of the discontinuation of nine chat reference services", Library and Information Science Research, 28 (4): 521-547. Redden, Carla S. (2010), "Social bookmarking in academic libraries: trends and applications", The Journal of Academic Librarianship, 36 (3): 219-227. Scale, Mark S. (2008), "Facebook as a social search engine and the implications for libraries in the twenty-first century", Library Hi Tech, 26 (4): 540-556. Secker, Jane (2008), Case Study 5: libraries and Facebook, available at: http://clt.lse.ac.uk/Projects/Case_Study_Five_report.pdf. Secker, Jane and Gwyneth Price (2007), "Libraries, social software and distance learners: blog it, tag it, share it! ", New Review of Information Networking, 13 (1): 39-52. Sekyere, K. (2009), "Too much hullabaloo about Facebook in libraries! Is it really helping libraries? ", Nebraska Library Association Quarterly, 40(2): 22-27. Shucha, Bonnie (2007), IM a librarian: establishing a virtual reference service with little cost or technical skill, available at: http://www.llrx.com/features/virtualreferenceservice.htm. Smith, Shannon D. and Judith B. Caruso (2010), The ECAR Study of Undergraduate Students and Information Technology, EDUCAUSE, available at: http://www.educause.edu/Resources/ECARStudyofUndergraduateStuden/217333. Steel, Emily and Geoffrey A. Fowler (2010), "Facebook in privacy breach: top-ranked applications transmit personal IDs, a journal investigation finds", The Wall Street Journal, October 18, available at: http://online.wsj.com/article/SB10001424052702304772804575558484075236968.html. Steele, Tom (2009), "The new cooperative cataloging", Library Hi Tech, 27 (1): 68-77. Stone, Brad (2010), "Facebook sells your friends", Businessweek, September, 22, available at: http://www.businessweek.com/magazine/content/10_40/b4197064860826.htm. Thomas, Marliese, Dana M. Caudle and Cecilia M. Schmitz (2009), "To tag or not to tag? ", Library Hi Tech, 27 (3): 411-434. Tripathi, Manorama and Sunil Kumar (2010), "Use of Web 2.0 tools in academic libraries: a reconnaissance of the international landscape", The International Information & Library Review, 42 (3): 195-207. Wolf, Christopher (2008), The dangers inherent in Web 2.0, available at: http://www.adl.org/main_internet/Dangers_Web20.htm. Xia, David Z. (2009), "Marketing library services through Facebook groups", Library Management, 30 (6/7): 469-478. Xu, Chen, Fenfei Ouyang and Heting Chu (2009), "The academic library meets Web 2.0: applications and implications", The Journal of Academic Librarianship, 35 (4): 324-331. Michalis Gerolimos is a Lecturer at the Department of Library Science and Information Systems of the ATEI of Thessaloniki. Prior to joining the ATEI of Thessaloniki, he worked as an Academic Librarian at the Ionian University of Corfu for several years. His research interests focus on online information retrieval and online library services. He holds a PhD in Library and Information Science and a BA in Archives and Library Science from Ionian University. Rania Konsta is the Head Interlibrary Loan Librarian at the Ionian University Library and Information Center and the Supervisor of the branch library of the Department of Archives and Library Science. As a PhD Candidate, she investigates libraries' role on bridging the digital and information divide. She holds a MLIS from Ionian University and a BA in Library Science from ATEI of Thessaloniki.